I’m looking around my home after the Easter weekend, shaking my head at the discarded plastic eggs and remaining strands of fake orange and purple grass caught in the rug. I assemble my children’s school lunches and cringe at the plastic-covered cold cuts, the packaged snacks, the individual-size yogurts. 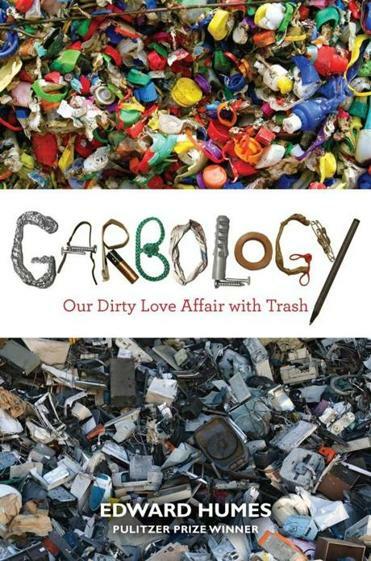 That response, I imagine, is the reaction that Edward Humes, author of the new book “Garbology: Our Dirty Love Affair With Trash,’’ is trying to provoke. The Pulitzer Prize-winning journalist has written an eye-opening account reminding us of something we try to forget: We are a wasteful society with a trash problem that is polluting our oceans and packing our landfills. Humes breaks his book into three parts. First he examines the scale of the problem, noting that Americans throw away about 7.1 pounds of trash per day, 102 tons of trash in a lifetime, more than any other peoples. He then picks through our refuse like a kind of social anthropologist to see what our garbage reveals about our culture and its values. Yet Humes’ book is not just a depressing tale of thoughtless waste and overconsumption. He ends on a hopeful note, leaving the reader with positive examples and reasonable alternatives to help every person make even a small difference. Humes lards “Garbology’’ with telling graphs and stunning statistics. But the most compelling parts involve the cast of colorful characters he meets along the way. He opens the book with a profile of a Chicago couple nearly buried in their own trash. They are hoarders, whose home was packed with debris, including furniture, soda bottles, and furniture they had never been able to unload. This couple, Humes points out, only differs from most of us because they couldn’t throw their refuse away. “The rest of us are just better at hiding it — mostly from ourselves,’’ he writes. He also introduces us to Mike Speiser, or Big Mike, who drives a bulldozer at the Puente Hills landfill in California, a man dedicated to managing the garbage mountain that receives the bulk of Los Angeles County’s trash. And we become acquainted with Bill Rathje, the “world’s first garbologist,’’ an archeologist who started the so-called “Garbage Project” at the University of Arizona in Tucson in the 1970s. Rathje’s mission? To sift through trash and interpret what it says about our civilization. While garbage has always been with us, Humes traces the start of our contemporary surge in waste to the “plasticization of America,’’ detailing the country’s growing love affair with disposable goods that took off in the 1960s. By far the most unsettling part of the book is his description of what these plastics have done to the world’s oceans. He writes of what is known as “garbage patches” in the Indian, Atlantic, and Pacific oceans, large swaths of sea filled with tiny pieces of plastic, a “plastic chowder,” consumed by fish and flooding into the world’s food supply. Thankfully Humes ends with positive stories of people making a difference on large and small levels. They include members of a Northern California family who now say they limit their annual unrecyclable trash to one small mason jar. Humes also takes the role of advocate, calling on readers to question the status quo and make changes through even minimal actions like banning the plastic bag and avoiding bottled water. “The smallest of steps can shave a piece from those 102 tons and save money for your household while you’re also saving the planet,’’ he said. Preachy? Perhaps. But this book gives a pretty solid argument for why we should heed his call.